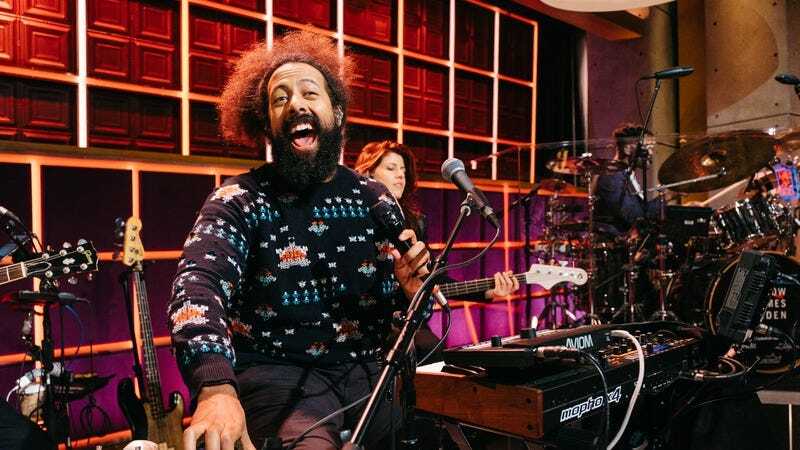 Tapping into the talents of comic voices like Reggie Watts, Baron Vaughn, and Chappelle’s Show’s Neal Brennan (plus the rapping and acting acumen of “My Vag” performer Awkwafina), Comedy Central has rolled out an ambitious slate of new shows and pilots for its upcoming season, mixing silliness and political satire with a strong focus on bringing more diverse voices into its fold. First up on the confirmed list: Watts’ Taskmaster, which sees the musical stand-up and former Comedy Bang! Bang! bandleader serving as the host (and all-seeing judge) for a bunch of comedians committing a series of inventively asinine jobs. Based on a British series of the same name, the show will see Watts and the show’s original creator, Alex Horne, forcing people to do things like “hide a pineapple on their person in the most discrete way” or “empty a bathtub as fast as possible.” From watching clips of the British show, it looks like lateral thinking and a general willingness to look like a complete idiot in service of your assigned task are key to a competitor’s success. Finally, the network gave the nod to Corporate, a new scripted show from Pat Bishop, Matt Ingebretson, and Jake Weisman. Described as a dark satire, the show stars Ingebretson and Weisman as cogs in a monolithic and cruel machine, pushed around and generally dog-ate-dogged by their sinister boss, the always awesome Lance Reddick. Meanwhile, Comedy Central also handed out a bunch of new pilots, including Brennan’s Home For The Weekend, in which he heads to comics’ hometowns with them for reflections and chaos, and Alternatino, from Arturo Castro, a.k.a. Jaimé from Broad City. It’s also granting a TV pilot to its digital series Delco Proper, Power Couple, from former SNL star Noël Wells, and a bunch of untitled projects from Awkwafina, Other People director Chris Kelly, Franchesca Ramsey, comic Jak Knight, and a South Side Chicago series courtesy of Bashir and Sultan Salahuddin. All told, it’s a big list of programs, with a strong focus on adding more diverse voices and creators to the network’s roster. We’ll be excited to see how many of these new ideas make it past the pilot stage (or at least the point where they finally get names of their own).